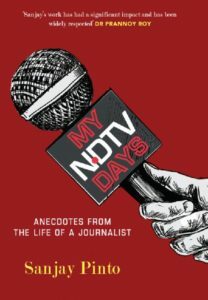 Sanjay Pinto, TV journalist turned lawyer and an Abhiramapuram resident has released a new book of fifty engaging anecdotes from his life titled ‘My NDTV Days’. Published by Pan Macmillan, it captures the thrill of breaking news liveon India first private 24 hour news channel. Sanjay Pinto was a former Resident Editor of NDTV 24×7 and says it was “a burning desire to chronicle my happy times, the pride of belonging to a world class organisation, working alongside the biggest names in the industry, the excitement of chasing the news, the adventures, the lessons, the hits and misses” that made him write this book, after his 14 year stint with the news network ended in 2012. Priced at Rs.350, My NDTV Days is available on Amazon and is also set to line the shelves in stores across India. This entry was posted on Monday, February 11th, 2019 and is filed under Community. You can follow any responses to this entry through the RSS 2.0 feed. You can skip to the end and leave a response. Pinging is currently not allowed.